We've sifted through all the new releases for Christmas 2015, and we're highlighting our favorites. 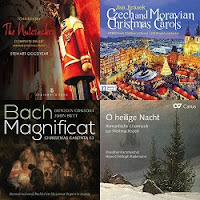 Some of these are obscure carols that may be new to you, while others are fresh takes on standard favorites. If you're like us and are constantly craving something to discover, take a spin through these tracks to get a taste of what is now available to you in NML. And if you hear something you love, click on the cover art in the player window to be taken directly to the full album!